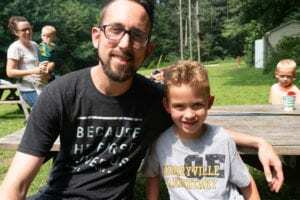 Families are looking for more than just a vacation, and Black Rock Retreat’s Christian Family Camp is the perfect solution. Experience new and exciting activities, Grow in your knowledge of and faith in Jesus, and Reconnect with your family on a deeper level at our 9th annual Family Camp! Your family will stay in our air conditioned retreat center, each sharing a private room with one queen size bed, two single beds and a private bathroom. Our rooms are laid out similar to a motel style room except there is no telephone or television in any of our retreat center rooms to keep you from being distracted from why you really came! Family friendly meals are served buffet style and you and your children will have plenty of choices available to enjoy. We are pleased to welcome back our friend and speaker Brian Holland. Brian has been in ministry for over 25 years in Southern California, starting in high school ministry then transitioning to young adults. He is currently the Teaching and Campus Pastor for the Claremont campus of Purpose Church. He is an outstanding speaker; he’s captivating, funny, but most importantly passionate to see people come to know and follow Jesus. He is asked to speak at many camps, chapels, and special events throughout the year. He gets to be married to his incredible wife, Kelley, and has two amazing sons, Tyler and Dylan. Brian’s purpose for ministry is to exalt Jesus as the greatest – one life at a time. Brad grew up at the Jersey Shore and married his high-school sweetheart Colleen. They found their home in PA when their first child was born and now raise their five children in southern Lancaster County. Brad ran his advertising firm for 11 years before being called into ministry as the director of family ministries at Wrightsdale Baptist Church. He enjoys using his background in creative communication to share the good news of Jesus with others. His teaching style is simple: If you are having fun, you learn more! Tiered Pricing is returning for 2019. We are introducing this three-tiered system that allows families to choose the price that best fits their financial situation. All families receive the same experience regardless of what tier they pay, and all families are free to choose the option that works best for them. For more information about the tiered pricing structure scroll to the bottom of the page. Family Max Pricing is based on a single room. If a second room is needed additional costs may apply. To meet the goals of developing and expanding the ministry of Black Rock Retreat, while also keeping Family Camp affordable for as many people as possible, we are introducing a three-tiered system that allows families to choose the price that best fits their financial situation. In the past, we have charged flat rates for Family Camp that were subsidized and did not reflect the full cost of our program. The new system still provides the standard low cost option, while also presenting the actual costs of camp for those who can afford it. All families receive the same experience regardless of what tier they pay, and all families are free to choose the option that works best for them. The price you choose remains confidential, only known by those who handle registration and payments. Please note that this pricing system is separate from our Sponsorship Program. To find out if you are eligible for sponsorship, email jsensenig@blackrockretreat.com or call us at (717) 529-3360. This has historically been our standard pricing to keep family camp affordable. Rather than raising all prices significantly, we will keep this rate as low as possible even though it does not fully account for the cost of our camps and programs. We can offer this option thanks to donors who share our vision to keep camp affordable and accessible to as many families as possible. This rate is closer to covering the expenses of Family Camp at cost, but results in less revenue than is needed to further develop our program. Choosing this option helps donations to Family Camp go farther in other needed areas. In addition to the expenses above, this rate reflects the costs of maintaining facilities, grounds, and equipment as well as providing additional resources to help other families to come who wouldn’t be able to afford Family Camp on their own. By choosing this option, you are joining in developing the ministry of Black Rock Retreat for future generations. Families are looking for more than just a vacation, and Black Rock Retreat's Family Camp is the perfect solution. Experience new and exciting activities, Grow in your knowledge of and faith in Jesus and Reconnect with your family on a deeper level at our 9th annual Family Camp! Here's a look at Last Years Family Camp.